One of the most powerful Intel processor solutions, Toledo i965R (S5180AG2N). The i965R S5180AG2N is a flexible Intel platform for multiple applications, based on the Intel Q965 "Broadwater" MCH+ICH8 chipsets. 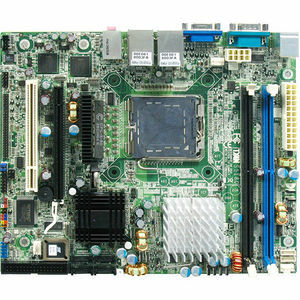 It is designed to support Intel Pentium 4, Pentium D and Core 2 Duo processors: Cedar Mill/Presler/Conroe Processors and up to 4GB DDR2-533/667/800 DIMM. This motherboard features 1 FLEX-ATX form factor, 6 USB ports, 2 Gigabit LAN ports, and 4 SATA-II ports. The S5180 offers exceptional performance and versatility for all your server platform needs.